The increased power requirements of today’s gaming systems, vending machines, medical equipment, vehicle control modules, industrial equipment, telecom equipment, air conditioning units, major home appliances and many other applications require power above 14A. OEMs know firsthand the trade-offs inherent in power design. The design engineer’s common lament is that existing connectors can’t deliver the power density they need. Power rarely concedes anything without extracting demands, whether space, efficiency, performance or all of the above. Design engineers may find their choices limited to connectors with insufficient current carrying capabilities or substantially higher than needed. The choice translates to risky current sharing schemes or costly connectors that are overkill for the application. Both options generally require more PCB space. One of the highest current-density options in the 14-23A power range is the new wire-to-board Mega-Fit® connector, which fills the void without cluttering your PCB. The compact design, paired with high current power terminals, provides more power per linear and square millimeter—making it one of the most power dense connectors for any application in the 14-23A per pin current range. 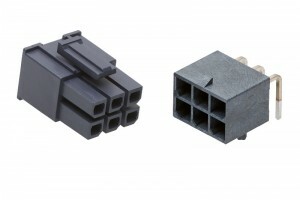 Mega-Fit connectors can offer additional current carrying headroom to allow for future product variants or to avoid maxing out power on a lower rated connector. The 5.70mm pitch Mega-Fit connectors boast a split-box terminal with six independent contact points, each able to move independently on a separate flexible beam, providing redundant secondary current path for improved long-term reliability in wire-to-board power configurations. In the case of accidental disconnect or hot plugging, the four forward contacts attract arcing and protect the two main points of contact when mating or un-mating, allowing the system to be hot plugged at up to 48V at 23.0A and has achieved UL recognition for current interruption. Available in right angle and vertical header configurations with gold or tin plating, the Mega-Fit connector comes standard with polarization features, fully isolated terminals, positive locking and retention pegs. The true measure of a connector is how well it handles power. So, maximize the power at hand without sacrificing design flexibility, space or performance.